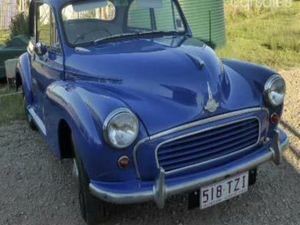 1955 Morris Minor 1000 Manual 2 Door - 948cc 4cyl Carb. original engine -. 52074 miles (83804 klms.) Registered until July 2017. Colour: Blue; Trim: Light Grey. Made in the UK. Vehicle is fitted with all standard factory options. Original vehicle with recent restoration to good standard of finish. Rear wheel drive, solid paint, chrome bumpers, steel rims with near new 5.00x5.20x14" tyres, seat belts, wiper jets, hood ornament, side mirrors, auxillary gauges. Professional bare metal re-spray with any minor rust spots removed and treated. New carpets installed with sound deadening fitted and upholstery retrimmed. New electrics and wiring installed, additional new brake master cylinder, wiper motor, Bosch battery, and wiring replaced. Replaced brake linings and shock absorbers.